Retired Catholic Archbishop of Lagos and former President of the Christian Association of Nigeria, Anthony Olubunmi Okogie, 81, in an interview with TOLUWANI ENIOLA explains how he became a Priest and all, but we have cut the the interview to the ones that concerns us here. Lol. 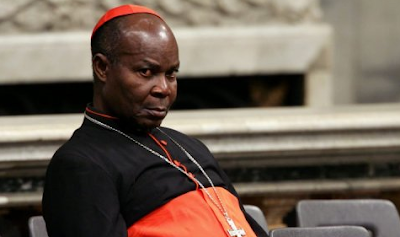 According to Okogie, he had three girlfriends before becoming a priest and how he lost them all will make you LAUGH. He also says being celibate isn't a big deal AT ALL. And Yo! Papa is still a virgin!!! Enjoy! Did you have girlfriends as a youth? I had a couple of girlfriends (laughs). When I got into St. Gregory College in 1951, I never knew anything about girlfriend. But I began to hear people talk about it. One of my friends advised me thus, “Why not get one of those girls at Holy Child School as a girlfriend.” I talked to one of them that I liked. I dared not write a love letter then because of my mum. My girlfriend told me her birthday. I told her we would celebrate it together. I went to meet one of my classmates, Adewumi, who has passed on. He said, “Birthday for your girl? That will cost you some money.” By then, I was only getting two shillings and six pence so I started saving. I went to Bombay Store in Idumota where they sold gifts. All you needed to do was to tell them the age of the recipient and they would brand it for you. I took the gift to her on her birthday. She was smiling profusely. She opened it without even asking me. I saw that the smile gradually faded away from her face. In anger, she said, “Tony, is this what your mates give their girlfriends?” I was surprised by her ungratefulness. That was my last discussion with her. In 1952, I had another girlfriend from Queen’s College, a very nice girl from a wealthy home. Anytime we met, I always went for her purse because she had money. On a Friday, she said, “Tony, tomorrow is Saturday. I want us to go somewhere together.” I said that was the time we did cleaning at home, that I could not make it. That was how I lost that one. I had another one when I was in class three. I told her I was going to be a priest. She was shocked. She said, “No, you can’t go. What about the entire plan I have been making.” When she found out I was resolute, she said, “If you become a ‘father,’ I will become a ‘mother’ too.” That was how she left me sad. Tell us about your temptation encounters. This question of yours is one of my temptations (laughs). Look at the length women go to make their hair look attractive. Some make their hair like an osuka (a load-carrying pad). It is a waste of money fixing attachments. God gave us eyes; if you don’t control them, they will control you. If you don’t control your senses, they will control you. Some women came around and started rolling their eyeballs to entice me. Some think they are not beautiful enough, so they apply eyelashes etc. No woman can entice me with that. How did you resist the temptation? I am neither a saint nor an angel. We are all human beings. I am only saying these are some of the things they do to draw and attract you. These days, some women even go about padding their breasts. This is absolute rubbish. When I see somebody I seem to like, I look for that part I don’t like and concentrate on that. You may think I am looking at you but I am not. No one is a saint. Only God is holy. Some people came to me to tempt me. One of them said, “Father, I can’t understand my husband. I am feeling cold.” I simply told her, “Why not warm your husband if you are cold. Say something that will enliven your husband.” She replied, “Father, you don’t understand.” I asked her, “What do I not understand? At my age, what do I not understand?” They use all these seductive words. It is not easy (resisting them) if you are not really fortified with prayers. God has been faithful. How difficult is it to be celibate? It is not difficult. It’s like breathing in air. Discipline is the key, like I said. I would have shared a few of the desperate attempts to tempt me but I won’t because of some reasons. Even when I preach my sermon, they come and challenge me in Yoruba, E de lo soro mi ni church. Mo gbo leni. (Why did you mention my case while preaching today? ).” It is not so easy. But once you can draw the line, there is no problem. Anytime a woman comes here, I am careful. You consider thoughts. It is when you say yes to a particular thought that you have sinned. Actualising the thought is where the imperfections come in.